In January, gains in intermodal, chemicals and petroleum-related shipments offset losses in coal, grain and motor vehicles. Norfolk Southern photo. U.S. railroads originated 1,238,487 carloads in January 2019, up 1.7%, or 21,054 carloads, from January 2018. 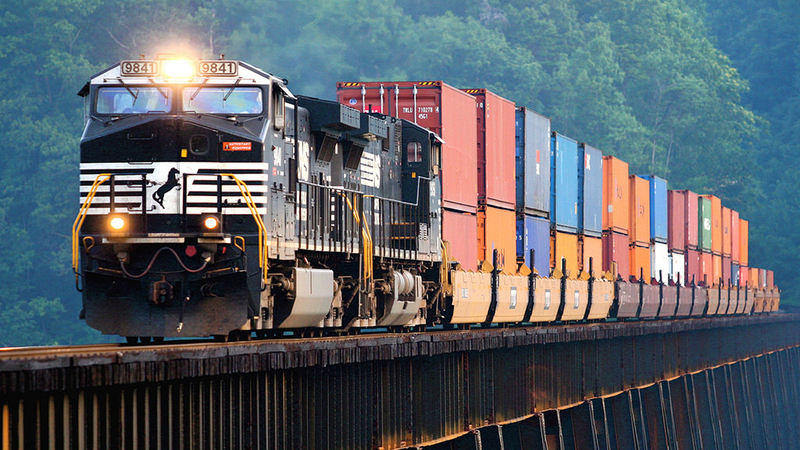 U.S. railroads also originated 1,316,168 containers and trailers in January 2019, up 0.5%, or 6,008 units, from the same month last year. Combined U.S. carload and intermodal originations in January 2019 were 2,554,655, up 1.1%, or 27,062 carloads and intermodal units from January 2018. 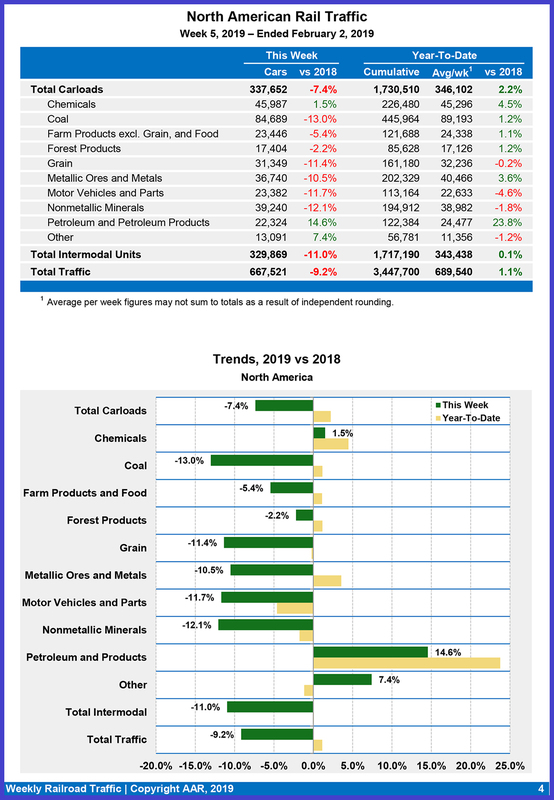 In January 2019, 11 of the 20 carload commodity categories tracked by the AAR each month saw carload gains compared with January 2018. 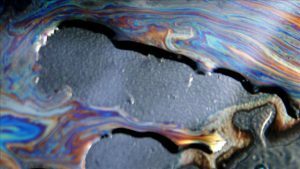 These included: petroleum & petroleum products, up 12,791 carloads or 23.9%; chemicals, up 3,841 carloads or 2.5%; and primary metal products, up 3,103 carloads or 7.2%. Commodities that saw declines in January 2019 from January 2018 included: crushed stone, sand & gravel, down 2,118 carloads or 2.2%; coke, down 2,046 carloads or 9.9%; and motor vehicles & parts, down 2,015 carloads or 2.7%. Excluding coal, carloads were up 21,864 carloads, or 2.7%, in January 2019 from January 2018. Excluding coal and grain, carloads were up 22,984 carloads, or 3.3%. 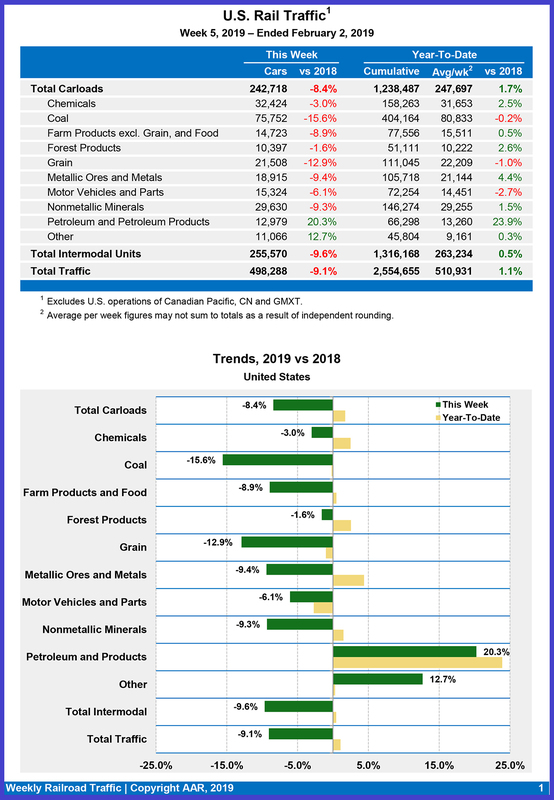 Total U.S. carload traffic for the first month of 2019 was 1,238,487 carloads, up 1.7%, or 21,054 carloads, from the same period last year; and 1,316,168 intermodal units, up 0.5%, or 6,008 containers and trailers, from last year. Total combined U.S. traffic for the first five weeks of 2019 was 2,554,655 carloads and intermodal units, an increase of 1.1% compared to last year. Total U.S. weekly rail traffic was 498,288 carloads and intermodal units, down 9.1% compared with the same week last year. Total carloads for the week were 242,718, down 8.4% compared with the same week in 2018, while U.S. weekly intermodal volume was 255,570 containers and trailers, down 9.6% compared to 2018. North American rail volume for the week ending February 2, 2019, on 12 reporting U.S., Canadian and Mexican railroads totaled 337,652 carloads, down 7.4% compared with the same week last year, and 329,869 intermodal units, down 11% compared with last year. 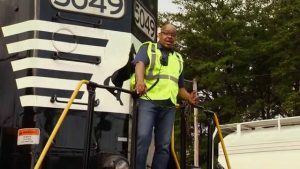 Total combined weekly rail traffic in North America was 667,521 carloads and intermodal units, down 9.2%. 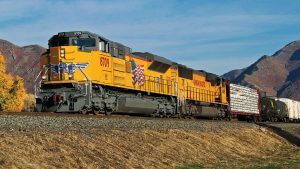 North American rail volume for the first five weeks of 2019 was 3,447,700 carloads and intermodal units, up 1.1% compared with 2018. 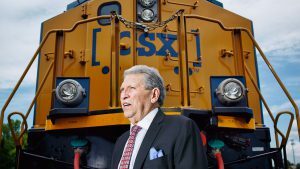 Canadian railroads reported 76,671 carloads for the week, down 2.2%, and 62,070 intermodal units, down 12% compared with the same week in 2018. 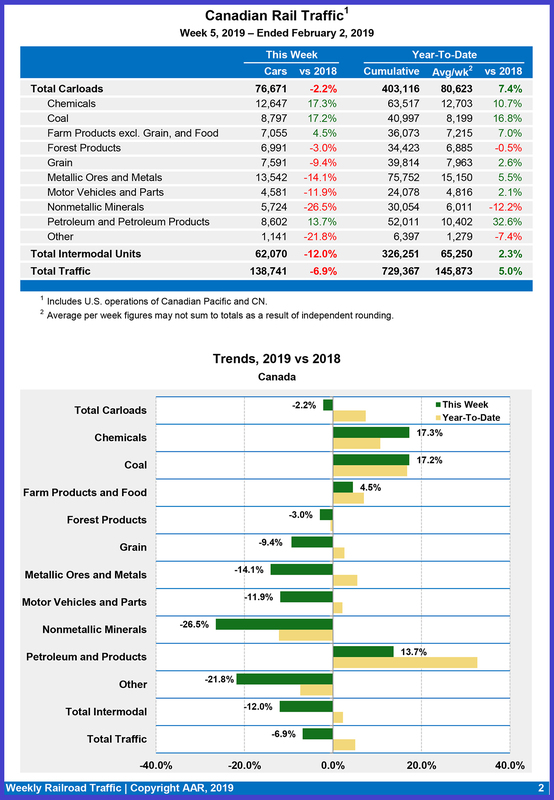 For the first five weeks of 2019, Canadian railroads reported cumulative rail traffic volume of 729,367 carloads, containers and trailers, up 5%. Mexican railroads reported 18,263 carloads for the week, down 13.1% compared with the same week last year, and 12,229 intermodal units, down 28.3%. 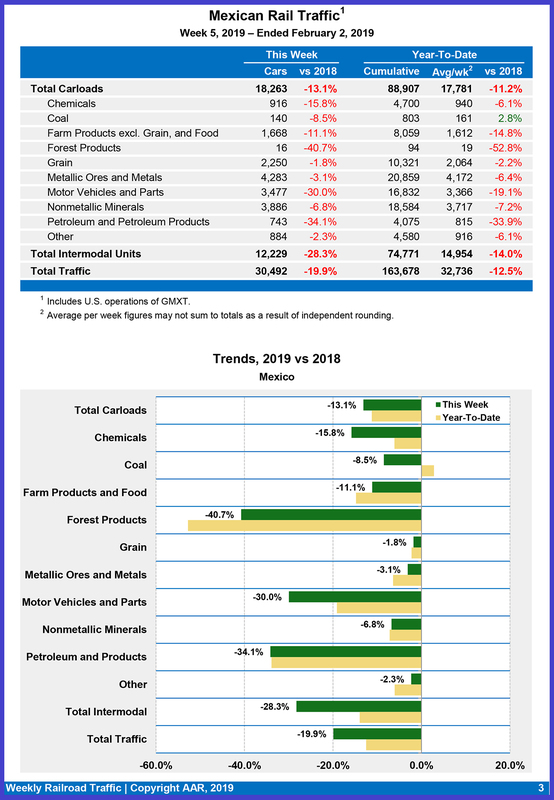 Cumulative volume on Mexican railroads for the first five weeks of 2019 was 163,678 carloads and intermodal containers and trailers, down 12.5% from the same point last year.